Heavy duty ultra-violet light absorber, creating a safer working environment. Suitable for workshop areas where welding, cutting and grinding operations take place. Packed in kit form and can be erected without the use of tools. The material is impervious to burning should the material come into contact with welding splatter. Material has been tested for ultra-violet transmittance with readings of 0.005%, 0.001% and 0.05% allowing only 15% visible light. Available either on hanging galvanized hardware (strips ONLY) OR a standard 2m x 2m freestanding frame with wheels. 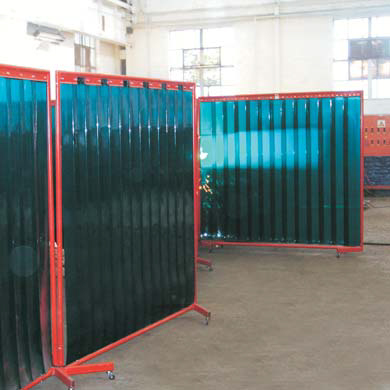 Types of welding curtains available: yellow or blue strips or sheets.